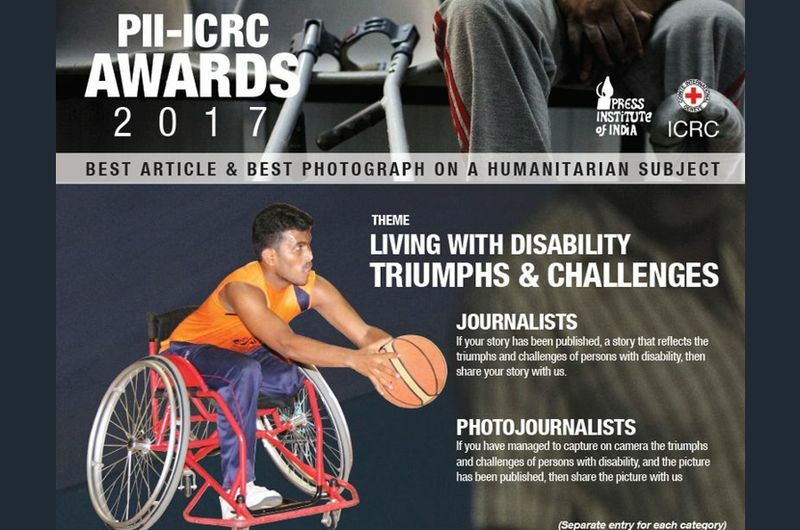 The Press Institute of India (PII), Chennai and the International Committee of the Red Cross (ICRC), New Delhi invite entries for the PII – ICRC Awards 2017. The theme for this year is ‘Living with Disability – Triumphs and Challenges’. The top three entries in each category would receive ₹60,000, ₹40,000 and ₹25,000 respectively. 1. Email your entries to editorpiirind@gmail.com or send them to the Press Institute of India, RIND Premises, Second Main Road, Taramani CPT Campus, Chennai / 600113 by 15 September 2017. 2.The article/photo should have been published in an Indian national or regional newspaper or a magazine between April 2016 and March 2017. 3. An exact English translation is mandatory for all articles printed in regional languages. 4. Only one entry per individual is permitted for either category. 5. Participants will be asked to submit the proof of their entries in the respective newspaper or magazine. 6. Family members/relatives of the jury and organisers are not eligible for participation. 7. The decision of the jury will be final. The results will be announced in November 2017. For any clarifications please contact: Sashi Nair, Director & Editor, Press Institute of India or Surinder Singh Oberoi, Political Advisor, International Committee of the Red Cross.